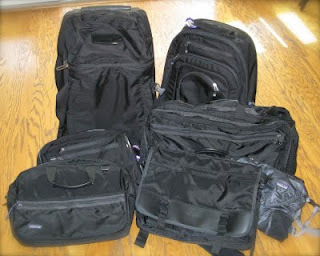 I've accumulated a variety of Patagonia bags for work and travel. I've found them functionally designed and very durable. My favorites are the large wheelie (top left) and the Maximum Legal Carry (middle right). The MLC wheelie is perfect for camera gear (top right). A couple of these bags were replaced (no charge) by Patagonia (a wheel was smashed on the large wheelie and the interior surface of the MLC was damaged)--they have a great guarantee! A few months ago my PowerMac G5 was repaired without charge (even though Apple Care had expired). I returned to the South Coast Plaza store when the G5 failed again and left the G5 for repair (and assumed I would be charged for the repair). I really didn't expect Apple to replace the G5 with a new Mac Pro! What superlative customer care. Thanks to Matthew at the Genius Bar (he listens carefully and explanations are clear and concise) and Joyce who contacted me about the swap (very thorough/professional ) and coordinated the exchange; Justin was really helpful too. Shortly after Apple Care expired for my Power Mac G5 (Dual 2.7 GHz; late 2005) various problems were experienced (e.g., non wake from sleep; loud fan; etc.). Subsequently, a liquid coolant leak was observed. I visited the Genius Bar at the Costa Mesa Apple Store and was helped by a very efficient Apple Genius and was informed that repairs would be completed at no cost. My Mac is now home and functioning like new. Thank you Apple!